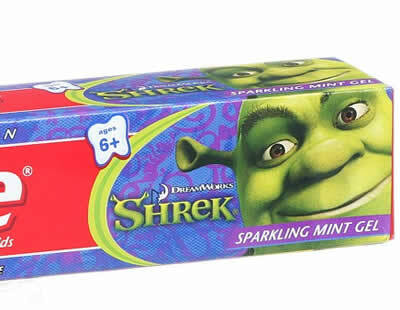 Okay being the renowned cheapskate that i am,I got some clearance toothpaste (shrek related) and when I squeezed it out it was clear green with glitter in it, which got me thinking why does all toothpaste have to be mint flavoured, and why not funky colours, okay i realise white looks clean, but you do rinse your mouth afterwards. I mean why is there no cheese and onion flavoured toothpaste or pork scratching or lemon and honey, now theres a good combination the cleaning power of lemon with the soothing power of honey. Mint is boring if you are going to use a herb why not parsley or caraway seed flavoured, but no pretty much every toothpaste uses plain old mint and its because we have been conditioned to believe mint is the smell of cleanliness, but then why aren't toilet cleaners mint scented instead they use food smells like vanilla or berry which just makes you hungry when you are taking a dump, quite frankly I'd rather have a minty fresh toilet and vanilla scented breath than the other way around.